This 'non-observable cause' has in the past been called God, Allah, Jehovah, Spirit, etc. "a scalar quantity is considered to be a quantity that has magnitude or size, but no motion." Question1: Can you offer the layman an extremely simplified summary of what scalars are, how they relate to Maxwell's equations,unified field theory, and the limitations of currently accepted quantum physics, relativity theory, and electromagnetics? A: Whew! You've asked for a complete explanation of how to unify the three major disciplines of physics, specify what's wrong with the three present versions of those disciplines that has prevented their unification, and how this was in Maxwell's original quaternion equations (some 200 of which are actually his theory, not the pale four vector equations written by Heaviside and Gibbs). You also asked for an explanation of scalars versus vectors, and how the present vector analysis (of Heaviside and Gibbs) misses the boat with respect to structured scalars. And you've asked me to do it simply, in layman's terms. To say that that's a tall order is the understatement of the decade! Okay, we'll have a go at it anyway. We'll start with scalars and vectors. Basically we visualize things in the universe as two sorts: those that move (have motion) and those that don't. In physics we know already that this is in error; there isn't anything in the universe, anywhere, that is motionless. At least it is moving through time, which is still a special kind of motion. Also, we know that everything seems to be made up of much finer things, and these finer things are always in motion - often very violent motion. So what we observe as a passive thing - sitting still spatially, so to speak - is made up of subthings in violent motion spatially. And the whole system that is not moving spatially is still moving in time. However, we don't see "time" but just space; therefore we see the thing as "motionless." However, the "motionless" thing we look at is rather like a fixed whirlpool in a swiftly flowing river the whirlpool seems to us to stay "fixed" and motionless, but internally its parts (the flowing water) are in constant motion. Another example is a container of gas under pressure - such as the air tank at the service station. The tank and "the air as a whole spatial volume" isn't going anywhere, and we see them as "motionless." But inside the gas its molecules are in violent motion, undergoing collisions, etc. Indeed, inside the walls of the tank, the molecules and atoms are in vibrational back-and-forth motion in a spatial lattice. In vector analysis, a scalar quantity is considered to be a quantity that has magnitude or size, but no motion. An example is pressure; the pressure of a gas has a certain value of so many pounds per square inch, and we can measure it, but the notion of pressure does not involve the notion of movement of the gas through space. Therefore pressure is a scalar quantity, and it's a gross, external quantity since it's a scalar. Note, however, the dramatic difference here between the physics of the situation and mathematics of the situation. In mathematics, when you say something is a scalar, you're just speaking of a number, without having a direction attached to it. And mathematically, that's all there is to it; the number doesn't have an internal structure, it doesn't have internal motion, etc. It just has magnitude - and, of course, location, which may be attachment to an object. However, physically, when we say something has pressure or a scalar value, that is not all there is to it. That particular aspect of the object or system may be scalar, but internally the thing it's labeling can still be decomposed into subsystems or particles or small things in violent motion. That is, in physics the scalar quantity can mathematically be further decomposed into an ensemble of vector quantities. Since these parts are rushing around in all directions but the whole is not translating through space, then obviously the sum of all those fractional motions must be zero. Scalar pressure, for example, can be decomposed into a myriad of opposing force vectors per unit area. Mathematically, a vector is an entity that not only may have magnitude or size, but is translating through space. In physics, we apply the vector concept to something that is moving, and/or to position. However, when we think further, that "something" is made of smaller things, which also are in violent motion, and these smaller things may be swarming all over the place with differing velocities - or even flowing at high speed in and out of the moving "system-thing" represented by the vector. So even here, the vector thing is a special case of an ensemble of smaller things. In the physical world, in anything - even inside a single point - there are always infolded vector things in violent motion. We may say that these interior critters are "hyperspatial" or "infolded" or "virtual" or "hidden". But they're real and they're inside the point, as seen by the external observer. The point is this. Everything seen externally is a plenum internally. In the real physical world, both a thing that's externally motionless (a scalar) and a thing (a vector) that's externally translating through space, are special cases of a system whose internal parts are always in motion. If the sum of the internal motions is zero, the external object seems to be sitting still and motionless to us (though it's still moving through time with - usually - uniform motion). We describe that internal characteristic of the system as a vector zero resultant system. Externally we may also characterize it as a scalar, because it still possesses attributes that have magnitude. On the other hand, if the sum of the internal motions is not zero, but is a motion in a certain spatial direction, then to us the external object seems to be moving along in space. That is, it is translating spatially. Externally it has both magnitude and direction, so we view it as a vector. To label a thing as only a vector is to look only at its external attributes. To label a thing as only a scalar is to look only at its external attributes. 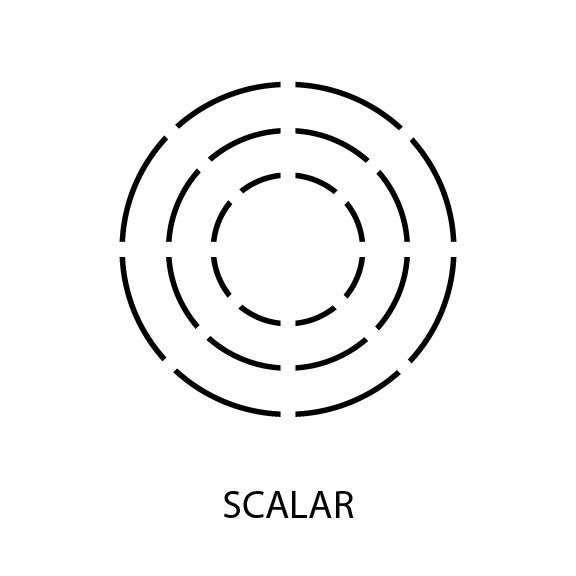 To look at its internal attributes, it must be recognized as a scalar and a vector at the same time. That is, the scalar attributes must be recognized to be composed on internal vectors. and therefore a hyperspatial or virtual-state vector structure. A vector is a thing in motion in a dimension (through a frame), whether in space, hyperspace, or time. Rigorously it is not possible to exclusively separate the notions of vector and scalar, because any scalar, to persist, is automatically a vector in time. These concepts or vector and scalar are normally not nearly so well clarified in standard physics and mathematics texts, unfortunately. Usually discussions of this type are reserved to obscure papers in foundations of mathematics. It may surprise the casual student, for example, that the notions of line, point, space, zero, length, dimension, frame, time, and observer have no truly acceptable definitions. Neither do the notions of force, mass, field, potential, etc. In fact, mathematics no longer attempts to explain how a line can be made of points. Instead, in foundations, it is simply stated as three postulations thusly "There is a class of entities called points. There is another class of entities called lines. Lines are composed of points." From a physics viewpoint, one of the big problems with the present vector mathematics - which is well-known not to be a complete system of mathematics in the first place - is that the presence of a bunch of vectors that sum to zero is just treated as a zero or absence of any vectors at all. That is, the absence of any internal vectors at all is made synonymous to the presence of a bunch of internal vectors that are fighting each other to a draw [(sum to zero)]. What this does is throw away the internal energy and internal ordered structuring of the medium - specifically, the energy of all the vector fighters that is continually going on inside the local medium - inside spacetime itself. Physically that's quite wrong, and one is throwing away exactly half the energy of the situation. There is a very real physical difference between a system of real vectors that fight to a draw [(sum to zero)] and so do not translate en masse, and the absence of any vectors and vector-fighting at all. The difference is composed of stress and its internal vector patterns - the internal energetic engines in local spacetime and local rest mass - in short, the energy trapped in the local medium. Where electrical students meet this hidden problem, of course, is in the fact that the four vector Heaviside equations of EM are not closed. One always has to assume that one or more of the "remaining potentials" is zero - that is, absent. So right there all the texts and professors reduce even Heaviside's equations to a special case of the absence of any "left-over and hanging around" scalar potentials. As an example, that little assumption gets rid of any possibility of the Aharonov-Bohm effect, where potentials alone can interfere, even in the absence of EM force fields, and produce real force effects in charged particle systems. That is, the sole agent of the interference of scalar potentials can induce EM changes, according to the experimentally proven Aharonov-Bohm effect, even in the total absence of EM force fields. Since 1959, it has been known in quantum mechanics that the EM force fields are not primary agents at all. We know that classical EM theory is completely wrong on this. QM shows that it's the potentials that are primary, not the force fields. In fact, it can be shown that the E-field and B-field do not exist as such in vacuum; only the potential for the E-field and the B-field exist in vacuum. Feynman pointed that out, but nearly all of his modern cohorts seem not to have recognized that fact. Indeed, vacuum is just a conglomerate of potentials, nothing more, nothing less. And if you just look carefully at the definitions of force and E-field, you see immediately that (1) force (nonrelativistic case) consists of mass times acceleration. Therefore a force consists of an accelerated mass. An electric force consists of an accelerated charged mass, normalized for a unit. But it really isn't treated that way in the EM theory, where it continues to erroneously considered to exist as a force field in the vacuum. At least you've got to use the adjectives "virtual" and "observable" to differentiate vacuum things from material things. One can correctly state that a virtual electric force field exists in vacuum, comprised of accelerating virtual masses, but not an observable force field. The observable electric force field requires, and consists of, accelerated observable charged particles. And the only place observable particles exist are in a physical medium, of a collection of one or more observable particles in space. So it doesn't take any special powers of thought to directly show that there are some very serious, fundamental things wrong with the present foundations of EM theory. There are lots of other flaws in EM, such as the fall of the Hendrik Lorentz force law in modern railgun experiments. The law has always been false, but is a sufficient approximation if the energy regime is not too high. Peter Graneau's work is fundamental in this respect. What the present vector system of EM does, therefore, is throw out the ability to use the very strong EM force as an agent to curve local spacetime. The very mathematics itself, a priori, assumes and guarantees a locally flat spacetime. And in an uncurved region of spacetime, for example, you are never going to make an over-unity machine - a so-called "free energy" machine that will give you more energy out than you put in - because the application of the vector theory a priori guarantees the elimination of any hidden sources from the local spacetime (ST) medium. If you're going to tap the trapped vacuum energy, and make a so-called "free energy" device, you're going to have to curve the local spacetime. That is the only way to produce a local energy source in the vacuum, from which a current issues. Notice that, when we put a paddlewheel in a river, we produce a free energy device because we tap some of the energy in the flow. But we tap a current, we do not just tap a potential per se. The entire secret of tapping vacuum energy, to build a free energy device, is to produce a current in the local vacuum potential that is self- sustained, and then tap that current. A: Yes. Suppose, for example, you connect a voltmeter across a wall circuit to measure the voltage. The meter needle moves against a spring with a force, as a result of the detection made by the voltmeter. The actual detection is an interaction inside the meter's probe which induces conduction electrons to move. We read the needle movement that resulted from those conduction electrons, and we infer so much voltage. The important point is this The voltmeter is measuring the energetics of its own internal change; it is not at all measuring anything external. All instruments measure only their own internal change. We infer the external thing that interacted with the instrument to cause the internal change. We do not measure the external entity directly, but only the results of its interaction inside the probe and meter. And even then, we measure only the external, spatial-translation energy of the instrumental interaction; we do not measure or account for the internal energy of that interaction. To state it more precisely The needle moved because conduction electrons accelerated away from the instrument's interaction area. This current flowed into a coil and produced a force on the needle movement, rotating the needle against a spring. At the same time, another current - a time-reversed, phase conjugate current - was induced in the atomic nuclei of the atoms in the interaction area. This "inner current" flowed Whittaker-wise through the atomic nuclei of the instrument, producing an equal and opposite force. (This is the mechanism that produces Newton's third law in the first place, as suspected by Feynman.) So the entire body mass of the meter recoiled slightly from an equal and opposite force, which we just loosely refer to - and recognize as - Newton's reaction force. It's there, it's real, but we completely neglect it in our electrical measurements. Usually we don't think it had anything to do with the external entity that interacted with the voltmeter. But it was a product of the same interaction of that external "something" within the meter. It's equal and opposite to what generated our electrical measurement. So exactly as much energy was produced in the "reaction force" energetics as was produced in the "external meter needle force" part of the interaction. We only measured and accounted for half the true energy of the interaction, or else you've got to discard Newton's third law. It follows that what actually entered into the interaction was a system of oppositely paired forces - a stress field, which is a scalar potential. This, of course, is consistent with our observation that vacuum itself is pure potential. As such, it consists of partial potentials of various kinds - it's highly charged, and the ambient vacuum scalar potential has very high magnitude. Remember that this ambient vacuum stress (potential) can be decomposed into sets of bidirectional forces. In our EM interaction, one-half of the stress pair - the half that is the normal photon-generated EM force was utilized to move the conduction electrons, involving primarily the electron shells of the atoms imbedded in the vacuum potential. The other half of the stress-pair interacted with, and moved, the atomic nucleus, causing it to recoil. The recoil of the nucleus was slight, because it is very, very much heavier than the accelerated outer electron. To sum it up. All detection is actually binary, it's not singular at all. When we detect photons or EM waves, we normally account for only the externalized translation part of the energetics of the interaction. We miss or neglect the internalized translation part, and we miss or neglect precisely as much internal energy as we account for externally. Again, I'm not the first one to point this out by any means. A: At the interaction area, a part of the instrument and the external causal agent are coupled together as a compound system. In that area, the mass of the instrument exists as atoms, each of which has an inner part (the nucleus) and an outer part (the electron shells). In the coordinate system centered on that compound system, conservation laws apply. The compressive stress of the interaction reacts internally - i.e., against the atoms with their inner and outer parts. Reaction from the nucleus induces a tensile stress. This tensile stress, in the simplest case, can be decomposed into equal and opposite forces, since stress is merely a set of such equal and opposite forces. One of the bidirectional interaction forces moves externally out of the atom via the electrons, electromagnetically producing a conduction electron current through the instrument and giving a needle reading. The second bidirectional interaction force moves ever inward, since it is a phase conjugate and reconcentrates inward ("crawfishes") rather than scattering outward. This forms a hidden Whittaker current through the atomic nuclei, producing a recoil on all of them. Precisely as much EM energy went into the inner system as went into the outer system. But we normally only measure and account for the external energy, and ignore the energy in the internal channel. A: I'll give you several of them that bear directly on this. See R. Chen, "Cancellation of internal forces," American Journal of Physics, Vol. 49, No. 4, Apr. 1981, p. 372. Chen gives a discussion of these summation vectors and internal vectors. He points out that the internal forces occur in equal and opposite pairs; in other words, as internal stresses. That's certainly pointing out the internal, bidirectional force structure of a scalar stress - a scalar potential, if we're talking EM stress and EM forces. Note that this internal pattern is exactly what Maxwell's quaternion theory captured and retained, and that the Heaviside and Gibbs vector theory discards. Further, the quaternions captured the internal order of this internal force vector structure as well. Second, in a beautiful article Kidd bluntly states that all our measurement/detection is really binocular. See Richard Kidd et al, "Evolution of the modern photon," American Journal of Physics, Vol. 57, No. 1, Jan. 1989, p. 27-35. E.T. Whittaker, of course, wrote the definitive engineering methodology of how to do all this with EM waves - how to infold the EM waves into a bidirectional wave structure that produces a standing wave of externally force-field-free scalar potential. The two Whittaker papers are (1) "On the partial differential equations of mathematical physics," Mathematische Annalen, Vol. 57, 1903, p. 333-355; and (2) "On an expression of the electromagnetic field due to electrons by means of two scalar potential functions," Proc. Lond. Math. Soc., Series 2, Vol. 1, 1904, p. 367-372.